We have so much fun being innovative in True Grub’s kitchen. We’ve experimented and perfected various types of cuisines and infusing the different styles. The kitchen at True Grub is a place of adventure! TRUE GRUB IS What We Are. We have a true passion for cooking and have perfected our craft over 10 years. We design our culinary creations from an intimate understanding of our clients' preferences and needs. We offer all natural, organic foods with no preservatives, and other special options. Our objective is to provide healthy meals without sacrificing taste. We are exceedingly flexible with our menu options, and can accommodate almost any client's budget. 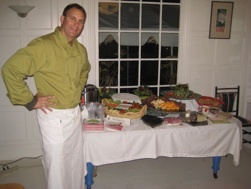 (organize and set up your event, pass hors d'oeuvres, cook on-site, and clean up afterwards). 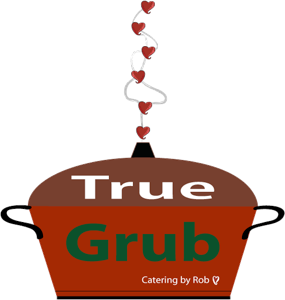 TRUE GRUB is looking forward to helping you design your event, theme, menu, and make food and beverage decisions. TRUE GRUB, with a passion for cooking, our name says it all. We exceed all expectations. References upon request. Fully licensed and insured.